In his article we will be discussing about OpenNLP named entity recognition(NER) with maven and eclipse project. We will be using NameFinderME class provided by OpenNLP for NER with different pre-trained model files such as en-ner-location.bin, en-ner-person.bin, en-ner-organization.bin. As per wiki, Named-entity recognition (NER) is a subtask of information extraction that seeks to locate and classify named entities in text into pre-defined categories such as the names of persons, organizations, locations, expressions of times, quantities, monetary values, percentages, etc. There are many pre-trained model objects provided by OpenNLP such as en-ner-person.bin,en-ner-location.bin, en-ner-organization.bin, en-ner-time.bin etc to detect named entity such as person, locaion, organization etc from a piece of text. The complete list of pre-trained model objects can be found here. There is a common way provided by OpenNLP to detect all these named entities.First, we need to load the pre-trained models and then instantiate TokenNameFinderModel object. Following is an example. 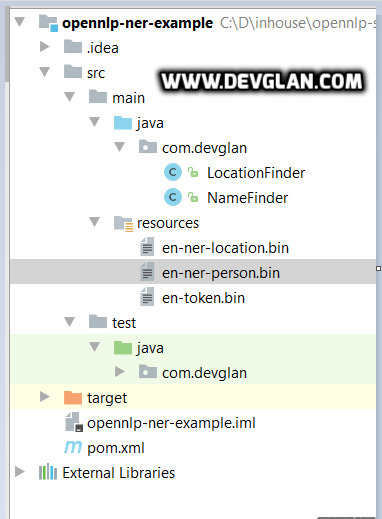 After this we need to initialise NameFinderME class and use find() method to find the respective entities. This method requires tokens of a text to find named entities, hence we first require to tokenise the text.Following is an example. Based on the above undestanding, following is the complete code to find names from a text using OpenNLP. * Created by only2dhir on 15-07-2017. Following are some test cases to detect named entities using apache OpenNLP.